The same type of microwave oven technology that most people use to heat up leftover food has found an important application in the solar energy industry, providing a new way to make thin-film photovoltaic products with less energy, expense and environmental concerns. Engineers at Oregon State University have for the first time developed a way to use microwave heating in the synthesis of copper zinc tin sulfide, a promising solar cell compound that is less costly and toxic than some solar energy alternatives. The findings were published in Physica Status Solidi A, a professional journal. “All of the elements used in this new compound are benign and inexpensive, and should have good solar cell performance,” said Greg Herman, an associate professor in the School of Chemical, Biological and Environmental Engineering at OSU. 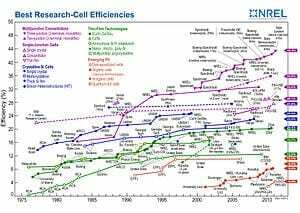 These thin-film photovoltaic technologies offer a low cost, high volume approach to manufacturing solar cells. A new approach is to create them as an ink composed of nanoparticles, which could be rolled or sprayed – by approaches such as old-fashioned inkjet printing – to create solar cells. To further streamline that process, researchers have now succeeded in using microwave heating, instead of conventional heating, to reduce reaction times to minutes or seconds, and allow for great control over the production process. This “one-pot” synthesis is fast, cheap and uses less energy, researchers say, and has been utilized to successfully create nanoparticle inks that were used to fabricate a photovoltaic device. Is the Secret to Cheap Energy Storage Hiding in Harlem?